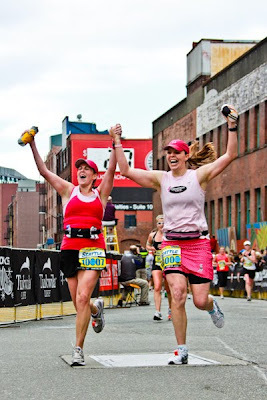 New Marathoner and AWESOME friend Jill sent me a link last night to the Rock N Roll website HERE. Marlene and I had made the website picture 23 of 36!! WOW!! 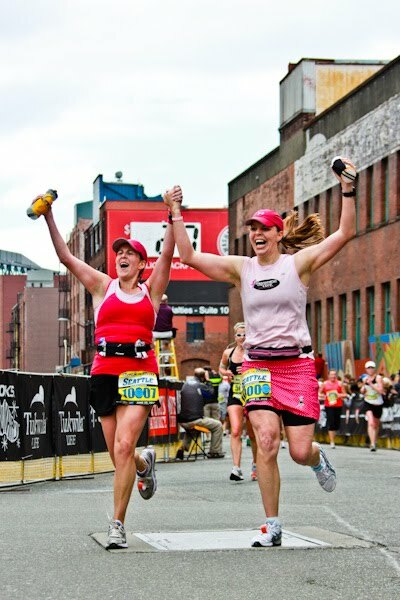 The looks on our faces tell the story of the amazing experience we had running this Marathon TOGETHER! I could not have asked for a better running partner. That is a classic picture! Great Job! Love your's and Marlene's blogs. Great picture!!! I love it. That picture is truly amazing! I was looking through those pictures last night and thought that was you. Great job! OMG GREAT picture!!!!!!!!!!!!!!! You guys look awesome!! Awesome picture!! Congrats on your time and being a Maniac. Fantastic job, that is truly what it's all about. Awesome picture. What a fantastic finish. That picture is awesome! Way to go and GREAT time!! YAY!!! You two look awesome. I have some good ones of you on the road... I'll be posting them shortly (from the sky by the way... gotta love delta). OOH and YAY on being a maniac!!! WELCOME!! We should have gotten a pic of you and prez Steve officially welcoming you into the maniacs. He wasn't too far in front of you. Oh well, next time! What a happy photo! You Rock Girl, congrats on another 26.2! Great picture! Congratulations on your maniac status! Thanks awesome!! celebrities in your own style! congrats! not only did you run 26.2, but you did it in late June- how incredible! That is awesome, congrats!! I think you can vote on your favorite pic from the website. Ill vote for you guys. So exciting and congrats on being a Marathon Maniac! LOVE it... so awesome. Which I had a friend to run MCM with me in October... can't wait to read more. That is a cute picture! You guys look like you're having a blast! Congrats on another strong marathon! That picture is so great! Congratulations on the strong finish! You two look great! Congrats on a great finish! I've only read your blog a few times but I thought that looked like you. Congrats!! Seriously, your like SO famous. I can't even fathom how you pull these things off...you must pay the photogs or something. Actually, i take that back. YOU ARE JUST THAT BAD A!! I love the picture, happy smiling faces :). Congrats!! One of the best pics ever!! That is the greatest race picture I've ever seen!